It has been weeks since the last installment of the Harry Potter movies was released, but I kept postponing writing the review out of sheer laziness. A day or two ago my father gently reminded me about how long ago we went to watch the movie, and so it sort of dawned upon me, and I finally pushed myself to sit and write down the review that I have been framing in my head for so long today. My father, a student of his and I went to watch the second installment of Harry Potter and the Deathly Hallows on the first show of the second day. Daddy and I had been rather worried that we would not get the tickets if we did not reach the hall much before the show timing. But strangely enough, once the show had begun we found that far from being houseful, there were rows of empty seats in front of us! This installment began from where the last part had ended, in Shell Cottage, at Dobby’s grave. For a while, Harry sat silently in front of the tiny grave. He then went inside the beautifully kept cottage of Bill and Fleur. It was evident that in spite of the war going on outside, it did not affect the Cottage interior at all. Such minute details have made the movie very heart warming. The next few scenes were done very beautifully. As Bellatrix Lestrange, the sadistic Death Eater and Lord Voldemort’s devotee, Helena Bonham Carter has always done well, but where she outdid herself was as Hermione disguised as Lestrange. Her first appearance as Hermione-disguised-Bellatrix was at Shelly Cottage itself, where Hermione had just had her Polyjuice Potion. The first thing that she asks on appearing in front of Ron and Harry was “Well? How do I look?”! It was one of the many sweet lines that the director has included in the movie. Helena played the part of Hermione-playing-Belllatrix splendidly. She walked clumsily, looked very awkward and completely ill-at-ease with herself. She even replied to a man who had wished her good morning in the Diagon Alley courteously, totally unlike what the real Bellatrix would do. As the book says, she aroused suspicion in the minds of people, and very soon everybody knew she was an imposter, and only Ron’s timely use of the Imperius Curse on the Head goblin of Gringrotts saved the day. 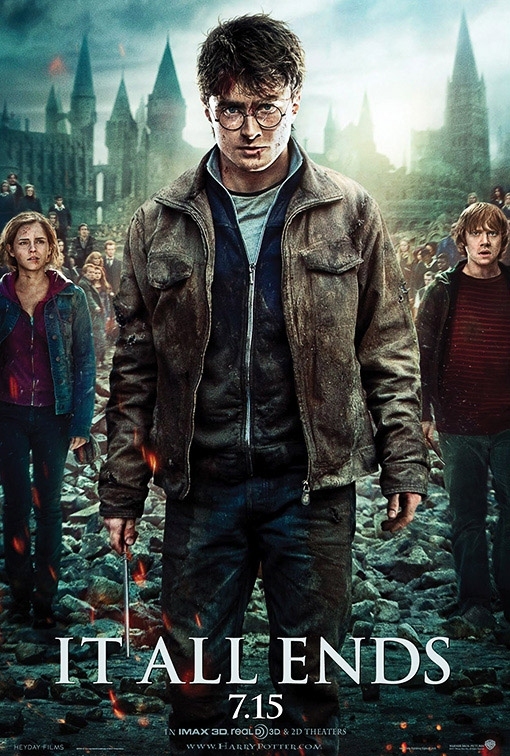 In this movie, the director has concentrated on the Battle of Hogwarts, so by the ending of the first hour of the movie, Harry and his friends had apparated to Hogsmeade to try and sneak into Hogwarts by some means. However their landing in Hogsmeade had turned on the curfew alarm that had been set by the Death Eaters. They are rescued by Aberforth Dumbledore, Dumbledore’s brother, and with his help, they follow a secret tunnel through a picture of the Dumbledores’ sister’s, and come out in the Room of Requirements, where many students now seemed to live. Here, the director has added some more of those quirky lines. After a huge applause that greeted Harry’s arrival, and the anticlimax when on seeing Ginny Harry just says “Hi”, the trio tell the people in the room “We have to find something, but we don’t know what it is, and where it can be found”! Then, as Snape addresses the students in the Great Hall and urges them to come up with any information they had of Harry’s movements that evening, Harry steps out of the group of students and says, “It seems despite your exhaustive defensive strategies, you still have a bit of a security problem, Headmaster.”! The eeriest part of the movie was positively the voice of Voldemort that rang through the school. At first, one girl started screaming in the Hall, and then another. And then the cold and steely voice of Voldemort could be heard all through the Hall, asking for Harry and commencing the battle of Hogwarts. The next part is short, but touching. Harry moves through the Great Hall, where all the dead and the injured wait for him. There is a faint smile on the faces of all those who are alive. The dead are being mourned. Harry sees the bodies of Fred, Lupin, Tonks. On the other side, Neville and Luna sit beside each other, with a look of contentment identical on both their faces. And finally, nineteen years later. It was a very nice way to end a great story. Harry and Ginny, Ron and Hermione see their children off to Hogwarts, some for the first time. Ron especially looks like a very satisfied family man. He has grown a paunch, and it looks like Hermione has been feeding him continuously for the last nineteen years! Even Draco has come to see his son Scorpius off, and he even smiles at Harry and family! The train rolls off, with all the children waving their parents’ goodbye, and there begins the story of the next generation. After the movie was over, I felt slightly incomplete, as if a part of me had ended with the movie. It was certainly a grand end of an era. For those like us, who have grown up with Harry Potter, a fan has nicely summed up this last movie in a letter of hers to the production team: “Goodbye Childhood". But for me, Harry Potter will go on forever. That is the beauty of good books and movies, I guess. Even after you have finished reading them or watching them, a part of them stays with you, your dear friend, forever. I've been waiting to read your review as soon as you told me you'd write one...and especially after I went and watched the film. I've got to say that reading this review of yours was for me better than watching the movie. Your narration is more gripping and interesting and humorous (Ron and his paunch) than the movie, and I couldn't agree with you more on your final words for this review. For one thing, I'd already forgotten about the detailed bits that the director added making the movie memorable, and which I actually enjoyed (the opening scene, the cottage, the funny one-liners - even the ridiculous one voiced by Professor McGonagall - and the girl's shriek followed by Voldemort's eerie voice, the depiction of The Battle...). Even that particular scene where Harry meets Dumbledore left me feeling dissatisfied, and you've pointed out to my dissatisfaction. It was Mr. Harris who would have been better (you'll enjoy reading up on Mr.Harris on wikipedia...). The scene also felt too short and far too rushed and it didn't capture the deep warmth when Dumbledore and Harry meet (or that feeling of silent nothingness and naturalness when Harry first finds himself there). 'Course in all this while I've never been able to figure out what Dumbledore meant when he said that Dumbeledore-ish liner. As for your point regarding Helena Bonham Carter would you believe I'd forgotten that it was she who played that role until you reminded me. I kept thinking it was Emma Watson! Although I'd felt while reading the book that Hermione surely could have done a better job of acting out the part of Bellatrix....who knows. She obviously didn't. I do agree with you about the battle having been portrayed 'on an epic scale'; he did make it spectacular-spectacular in terms of action, and it was well managed. ....but there were parts there that were too rushed, or so I felt. That's all I think I'll say for now since as I had been worrying - I've forgotten some of my other big grouches regarding the movie. I went on a Sunday and nearly didn't telling myself that I wouldn't get tickets...when I landed there just ten minutes before one of the shows I was surprised when they told me at the counter that the show wasn't full. I even got a fine seat. I'm really happy you wrote this. And I'm glad I found it when I did. Made me grin. Read it twice through right away.